No idea how to PM on this site yet sorry, happy to do a couple a week if you would return the favour? Hi if you haven't found anyone yet add me on skype alfiejbear. 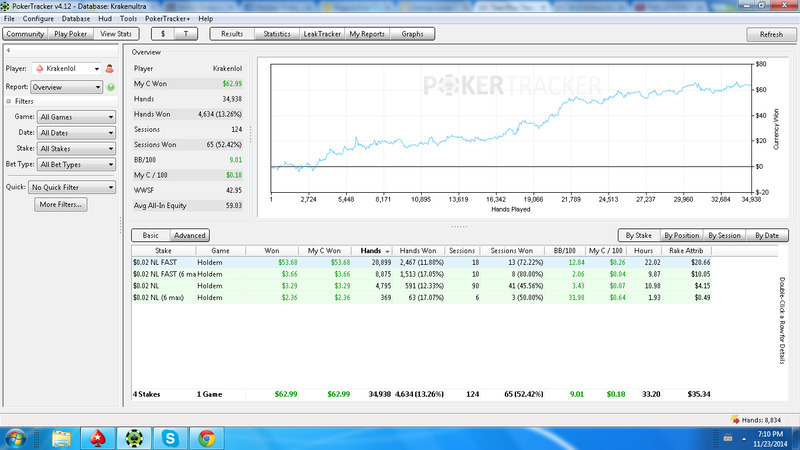 Starting at the 0.01/0.02 FR stakes, looking for someone to sweat 5-10pm UK time or I'm free all day on the weekends. Where do you play? I am trying to beat NL2 as well and I live in Europe so time difference will not be huge (1h to say precisely). However it would be nice to include also someone who already beaten NL2. I'm a former 6max grinder wanting to switch over to fr for both online and live play. I currently play NL25 fr and I would like to join a good skype-group for this purpose. Hello currently I am playing 15s hu hyper on stars and looking to explore new formats specifically cash game and looking for a study group and experienced cash game grinders to learn from. if any1 is interested plz add me on skype: mrrungood. I would be willing to return the favour by providing information/teaching how to play hu hyper. I'm interested in discussing some hands via Skype with anyone else who's willing to improve. Currently playing 25nl FR but looking to shot-take aggressively over the next few months. PM me if interested! Any 10-25NL who want to discuss hands and strategy? PM if interested - hoping to get a study group together. I would definitely be interested at discussing strategy, I am currently playing 10NL on pokerstars. Please let know when you are available and when/if a group is being set up. I am trying to get involved in the sweat sessions but I am unable to PM. Could you please tell me how to do this or perhaps give me a contact email which I could do this through. I'm looking for a sweat partner for 2/5NL 10NL max. Just looking for someone who is on a similar schedule as me, open minded, and wants to learn as much as I do. Not looking for coaching/advice just someone that wants to discuss hands and reasons for taking certain lines. If you're interested just let me know. Schedule: Tues-Sat 9pm-12am (MST -7) and Sun/Mon any time. Times are PST+1 Hour currently. Looking for sweat partner or just someone to study hand hands with - playing 10-25NL. PM me your skype. I'm a 10/16/25NL player from the UK looking for a sweat partner from between 6-11pm GMT. I'm 22, from the UK and i work during the week. lookiing for someone for sweat sessions, i just moved up to 5nl only played about 20,000 hands and currently breakeven, was winner at 2nl over 10 bbs, over 200,000 hands. Mix of random spewy curious bad play mixed with unfortunate variance and learning and beginning to use pt4 has me at a badstart on 5nl but i would like someone opinion to chat with abouut this level and maybe review each others play for some help improving our game. I play on pokerstars and can link up probably anytime from 10am est. thru like 12 a.m. I speak english and spanish. please p/m me as i dont have the priveledge yet. @FloatingAces, can no message you just yet. But would like too talk. Msg me on Skype (kedwards1).